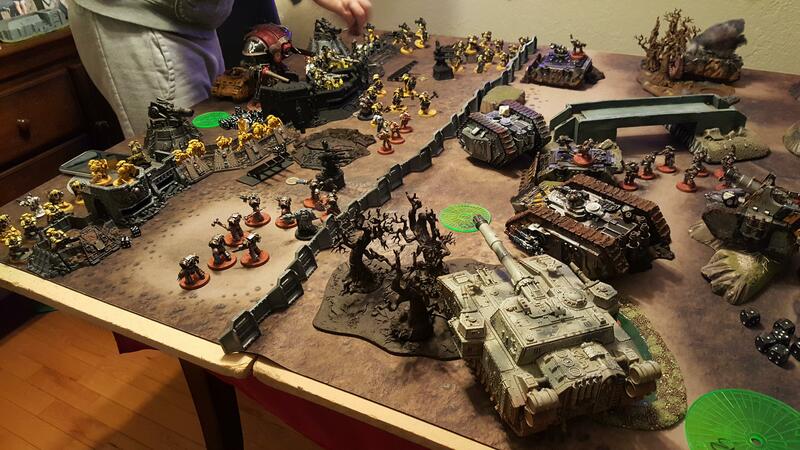 The ruined Imperial Fist defensive lines were still burning and spitting black smoke as Golg’s 11th Grand Company loaded into transports to begin the assault upon second and final lines of battlements just outside the actual city of Edinspire itself. 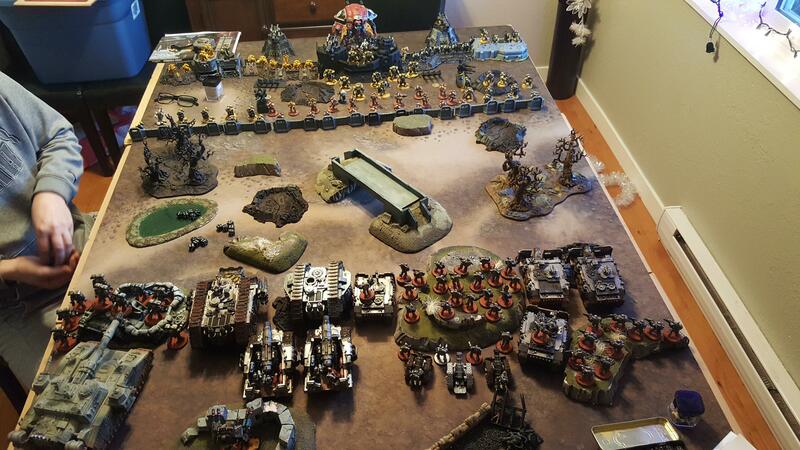 If his troops could smash through the final walls quickly it would allow the Iron Warriors to encircle their foe and finish them. 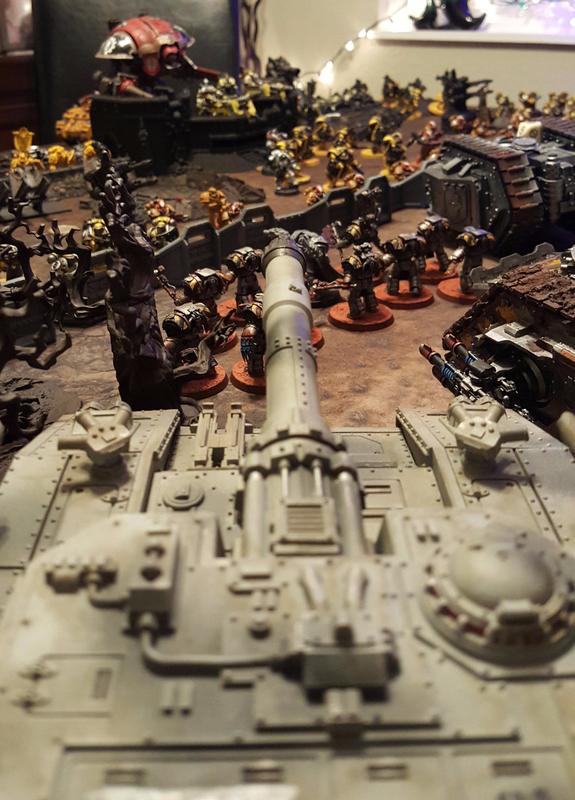 There was no time for a protracted siege anymore, only an armoured spearhead smashing open a vulnerable area in the walls for the rest to spill through. Gold pushed the medicae away from him, trying to patch his ruined face as he headed for his command spartan, The Iron Claw. Truth be told he still needed more time to heal and could feel it, but time was not a luxury he had and there was no possibility he would give up command to a lesser warsmith. The last man to enter his tank, he looked on as the rest of his warriors who could still walk from the first assault were loaded up into transports for the next wave. Only those completely out of action were left behind. Their weakness would not go unnoticed by Golg. He spat a bloody, acidic wad of phlegm onto the ground and entered his tank, the assault door bays closing behind him. 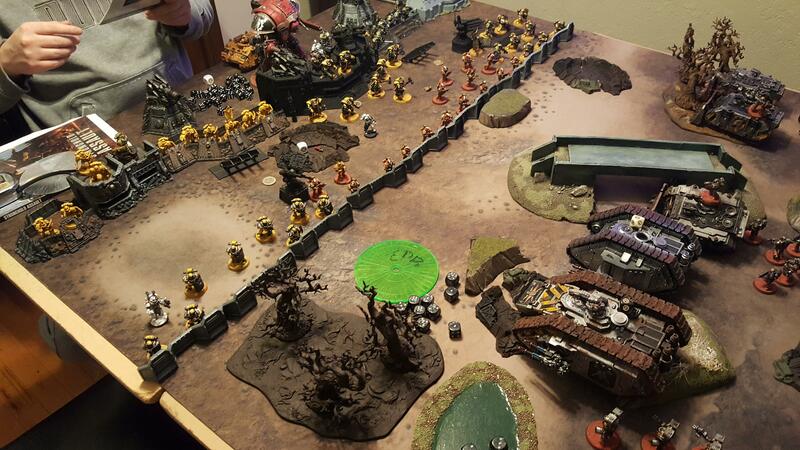 The Imperial Fists were dug in and heavily fortified. 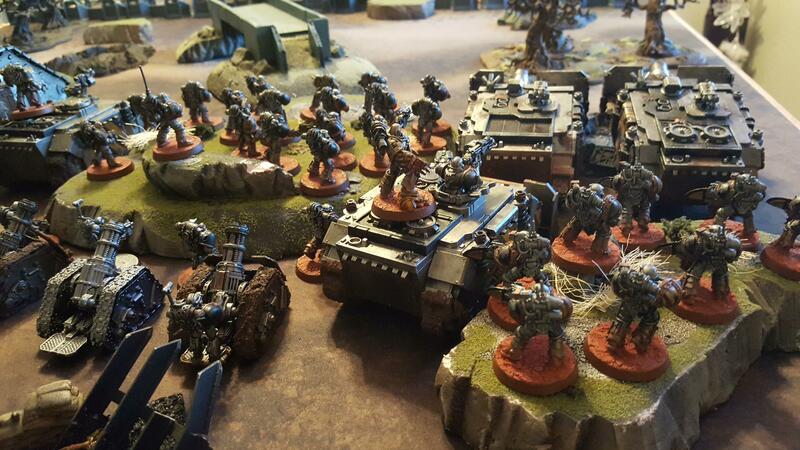 They knew the assault was only hours away and no legionary took their focus off the horizon, waiting for the first signs of the Iron Warriors advance. Captain Pollux, bruised but unbroken, had managed to fall back with only a ragtag band of survivors. Upon arrival he was surprised to find First Captain Sigismund waiting for him. He handed off command of his company to the senior officer and took his place on the line with his own men. He knew what the Iron Warriors were capable of. But he knew his own brothers were ready for whatever they might throw at them. 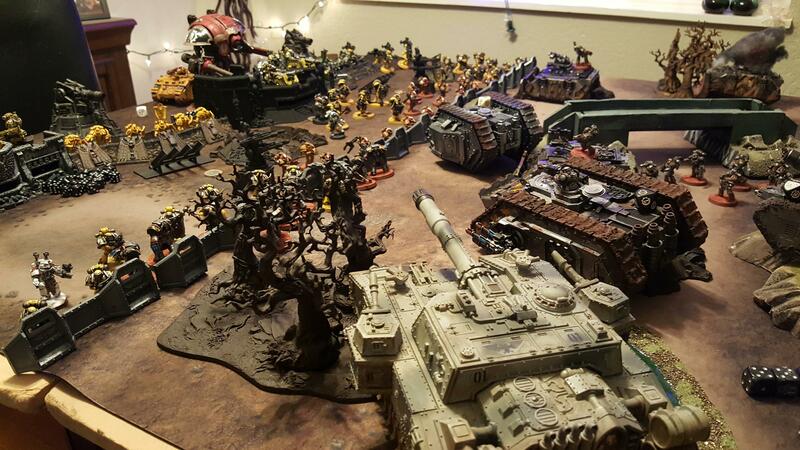 Welcome back to the battle report for game 2! 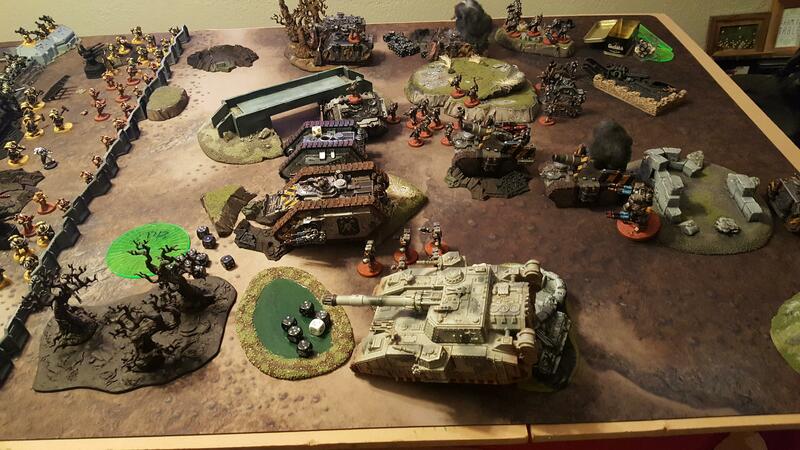 This game took place this past Monday and I finally got around to getting this battle report together. 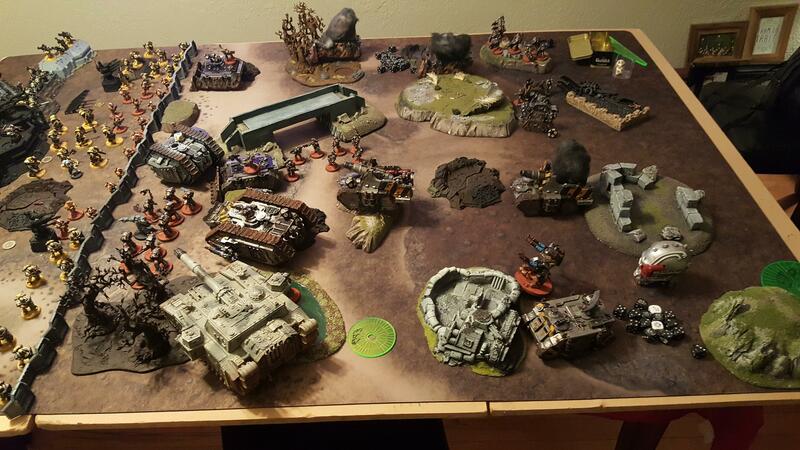 This was a bloody, 5000 point battle with both sides featuring a Lord of War. Mission 2 – Breakthrough. Victory Points determine the winner. Going lengthwise a long a 6×4 table. Attackers: At the end of the game, the Attacker scores 1 Victory Point for each of his units that is in the Defender’s Deployment Zone, and D3 Victory Points for each unit that has exited the board via the Defender’s table edge. Defenders: At the end of the game, the Defender scores 3 Victory Points for each Primary Objective he controls. In addition, at the end of the game, the Defender scores 1 Victory Point for each enemy unit that has been completely destroyed. 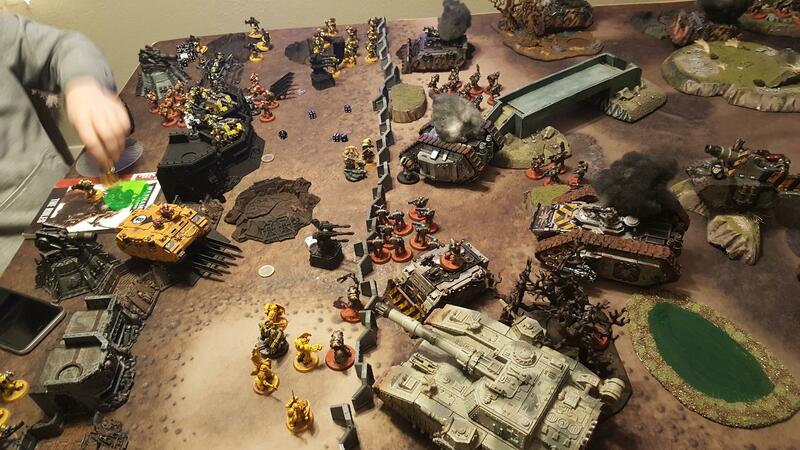 The Imperial Fists got first turn and began using all their long range fire to try and silence the Iron Warrior guns that would threaten their lines. 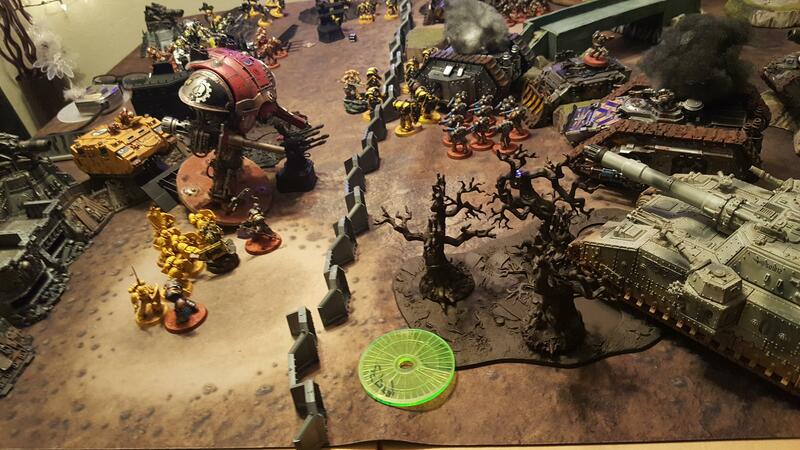 The automatic battlecannons fired large explosive rounds but the servitors manning them were unable to acquire proper firing solutions, only killing a few stray infantry. 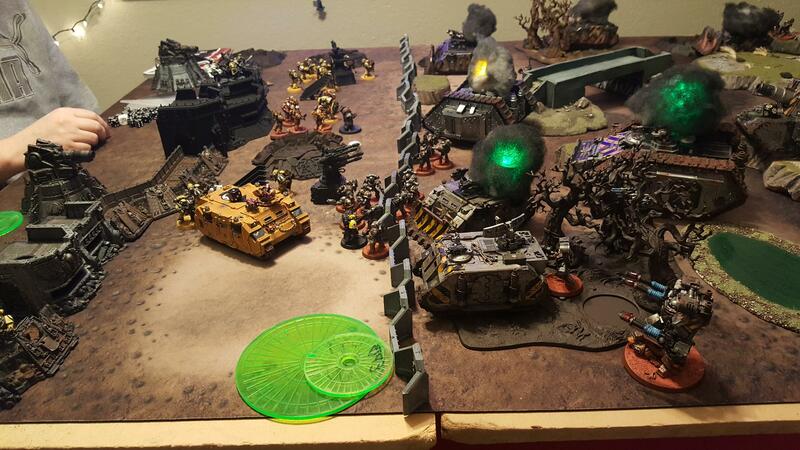 The graviton rapiers fired inside from inside the safety of the their central bunker and managed to damage both the spartan and landraider, but were unable to halt their advance. 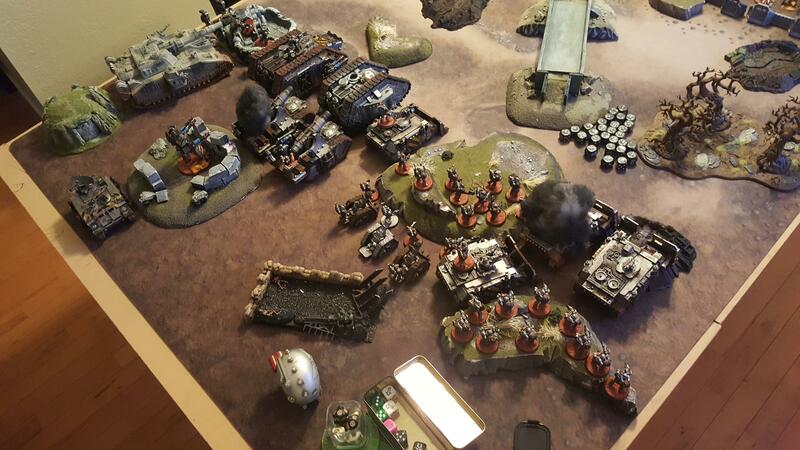 A group of rocket launcher armed infantry on the right flank were able to destroy one of the 2 vindicator siege tanks turning it into a flaming wreck. 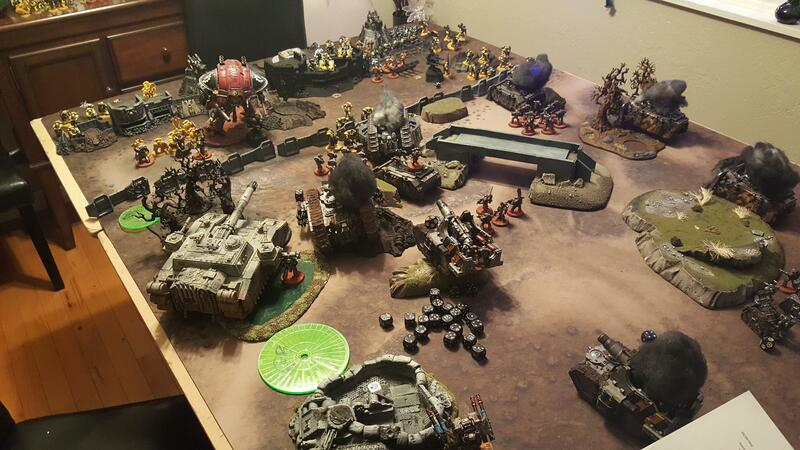 Finally a shot from the Knight Titan’s twin battlecannon was able to wreck 1 of the medusa siege tanks before it ever fired off a round. The Tyrant Siege terminators ate a face full of heavy vulkite fire losing half their number. 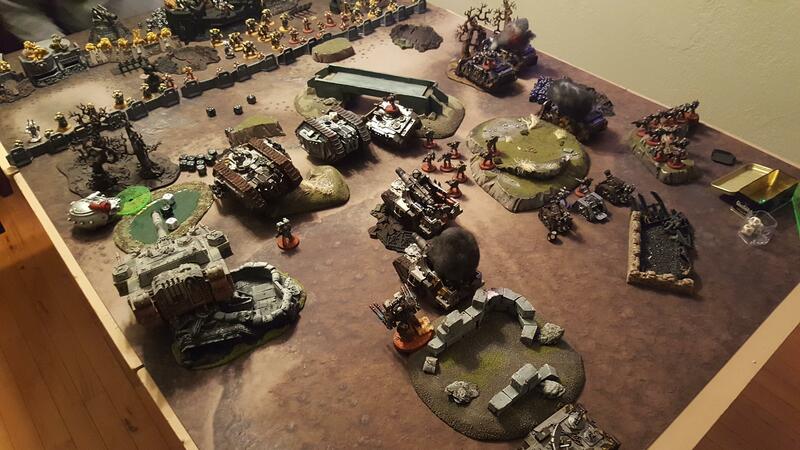 The Irons Warriors began by advancing straight up the table, with eyes on hitting the left flank as hard as possible. 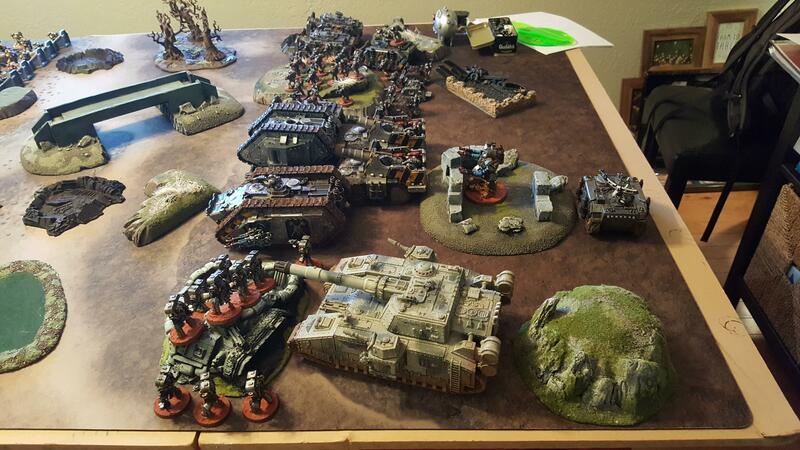 Their first turn was not as devastating as the previous game, managing to only destroy a single bunker (on the left flank). The central bunker was also damaged as well but not enough to break it. The artillery focused on the infantry at the front line in order to help open holes for the advancing tanks. 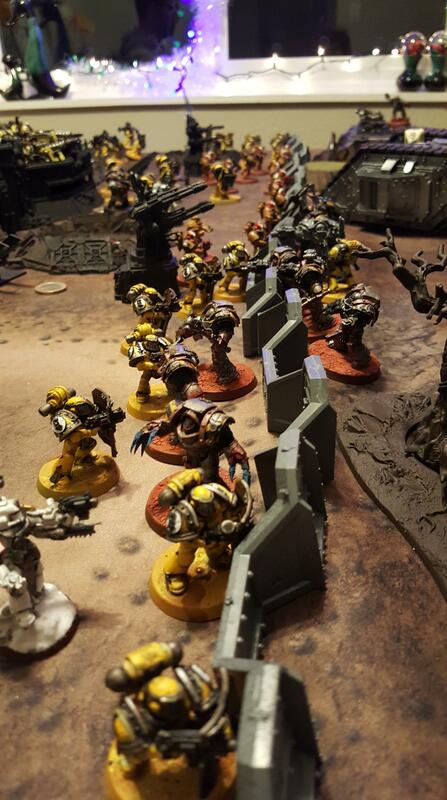 The Imperial Fists kept up the fire on the Iron Warrior vehicles, hoping to have the troops inside forced to unload short of their target. The second vindicator tank in the woods was taken out as well as further damage laid into the 2 land raiders, though not enough to stop them yet. The Tyrants took further vulkite fire and were reduced to a single man. 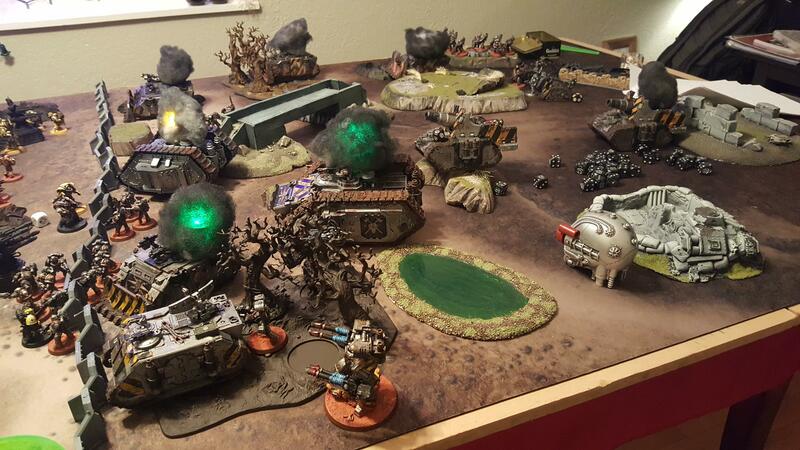 The other infantry took more rounds from the automated turrets but kept slowly advancing forwards. 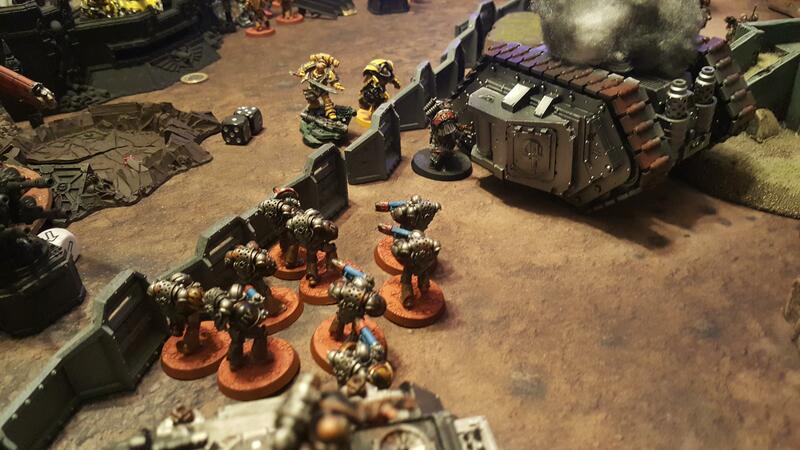 The Iron Warriors pushed their tanks further up the field and the Terminators jumped out of the Spartan to charge into the breacher and tactical squad in front of them. They managed to stay locked into combat until the next round. The center bunker was destroyed by massed fire and the rapiers inside forced out. 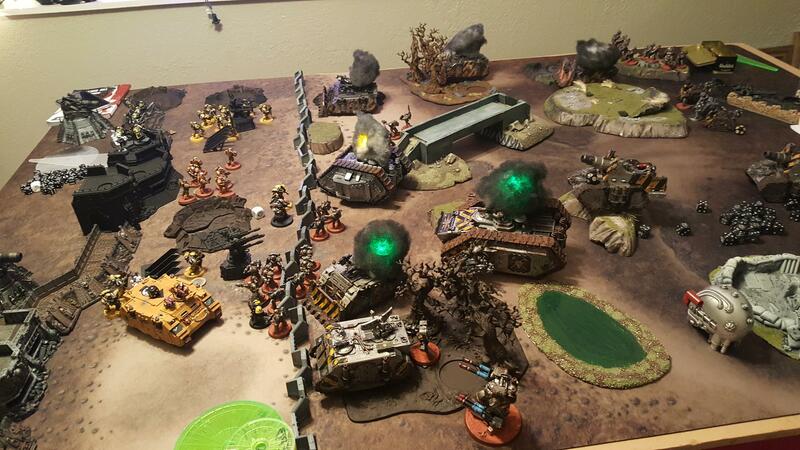 The Iron Havocs in the rear managed to bring down the right bunker in a massive explosion as its ammo stores went up. 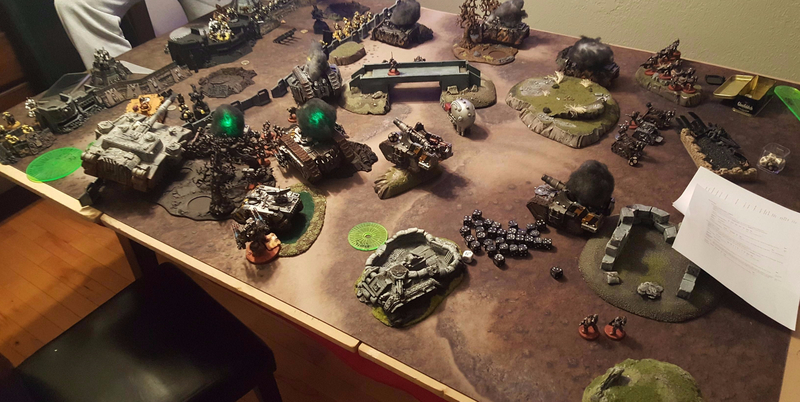 After the terminator assault by the Iron Warriors both Pollux and Sigismund sallied forth from both ends of the table. 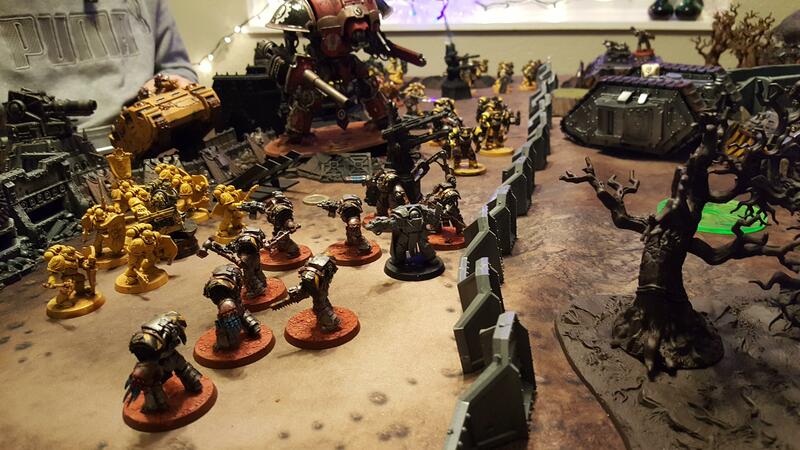 Pollux and his wardens went straight into the Golg and his terminators, backed up by their knight titan. Golg, seeing the massive captain approaching, bellowed a challenge out to his rival. The two ran straight into other and were locked in brutal close combat. Golg, still weakened by his previous injures, could not land a blow past the massive boarding shield that Pollux wielded. With speed that should not have been possible, Pollux managed to strike out catch Golg straight in the chest with his power fist, crumpling his massive terminator plate and sending him crashing to the ground. Before he could finish him off though he was pushed back by the Iron Warrior terminators while Golg was dragged unceremoniously from the battlefield. 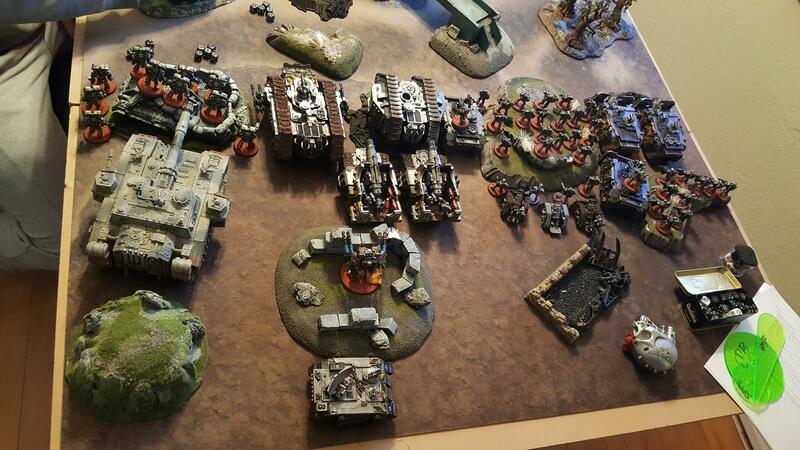 The knight titan and Pollux’s bodyguard crushed all but 2 more terminators, who fell back towards their own lines. The lone medusa siege tank managed to hit the knight square in the center of mass, stripping it of all but 1 hull point. 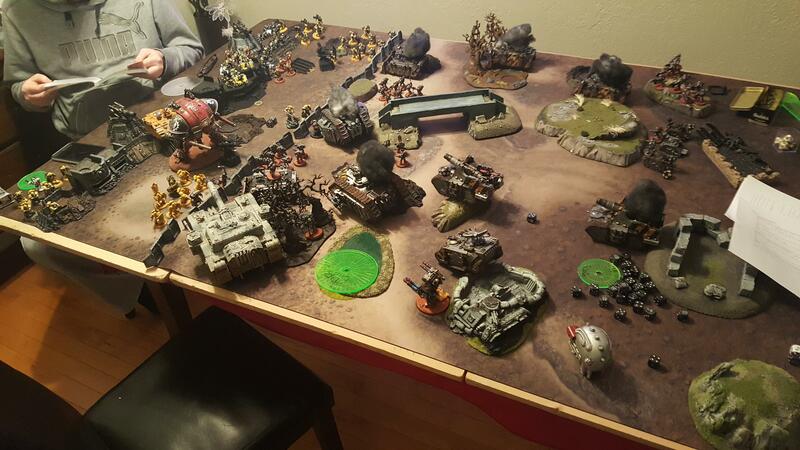 A final lascannon shot finished off the titan, causing it to explode and take out a few of the infantry back in the bunker. 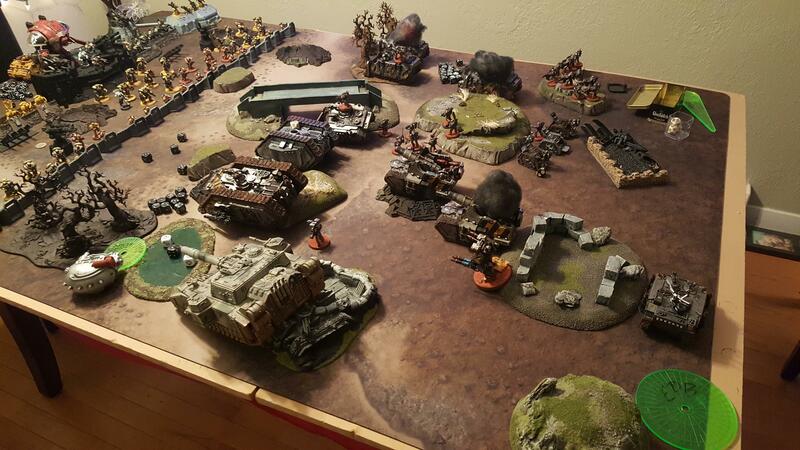 Meanwhile the Imperial Fist terminators, together with Sigismund, assaulted the remaining land raider to finish it off. This left the plasma support squad to funnel out the sides and, together with a tactical marine squad on the other flank, cut down all but Sigismund, 1 terminator and the primaris Medicae. 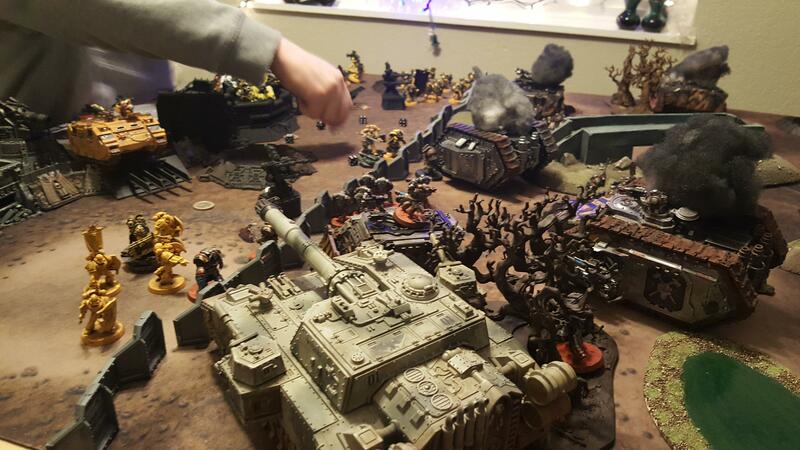 Sigismund responded by charging head long into the plasma squad, taking a hit to the arm before destroying the squad to a man. 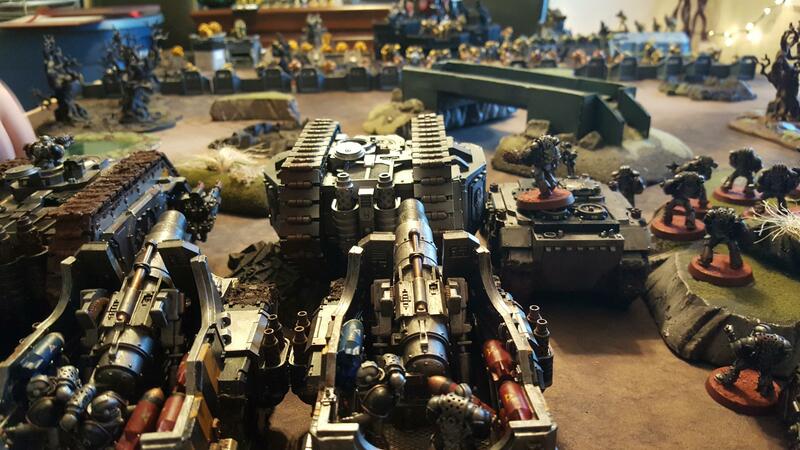 The final turns saw the Iron Warriors Shadowsword “Olympia’s Wrath” fire a point blank shot into Pollux and his unit, wiping them out and taking the captain out of action. In turn the tank itself was destroyed by a combination of anti tank fire and melta bombs. The Iron Warriors in the rhinos had both charged across into enemy ranks where they became locked in combat for the remainder of the game, scoring points for the Iron Warriors by getting into the enemy deployment zone. 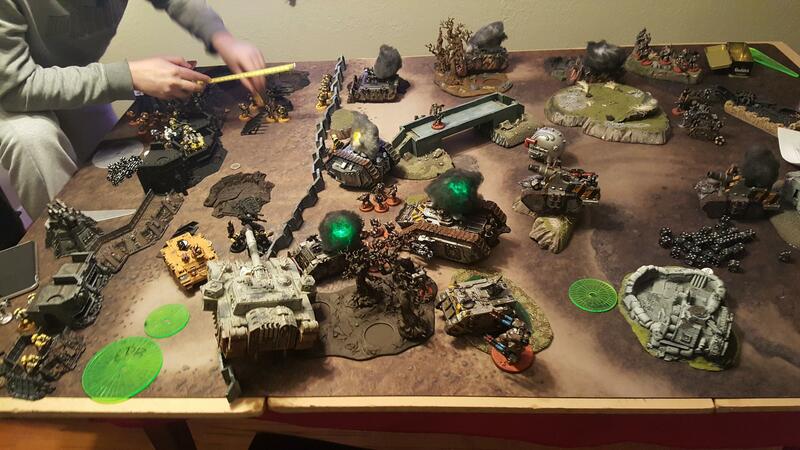 The medusa siege tanks, which survived 5 turns of fire, finally was taken out from the missile launchers in the rear. Sigismund, the mighty first captain, came under a massive fusillade of bolter fire from tactical legionnaries, which did exactly enough wounds to take him out of action. 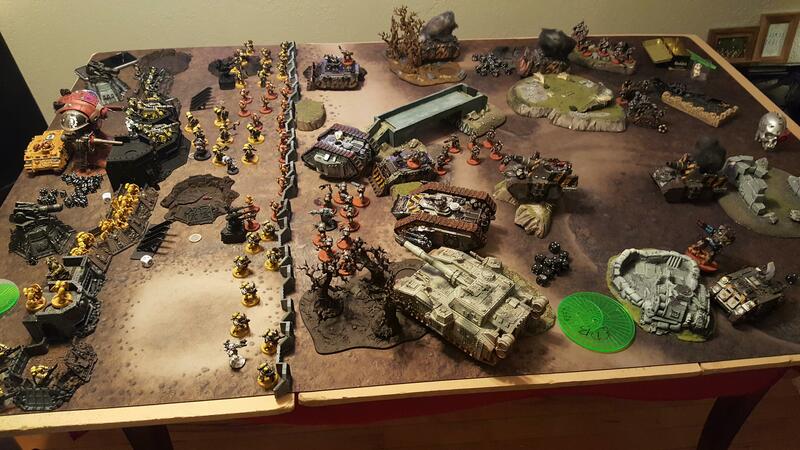 By this point victory was certain for the Imperial Fists, as none of the Iron Warriors had made it off the table and the Fists held their line of objectives. 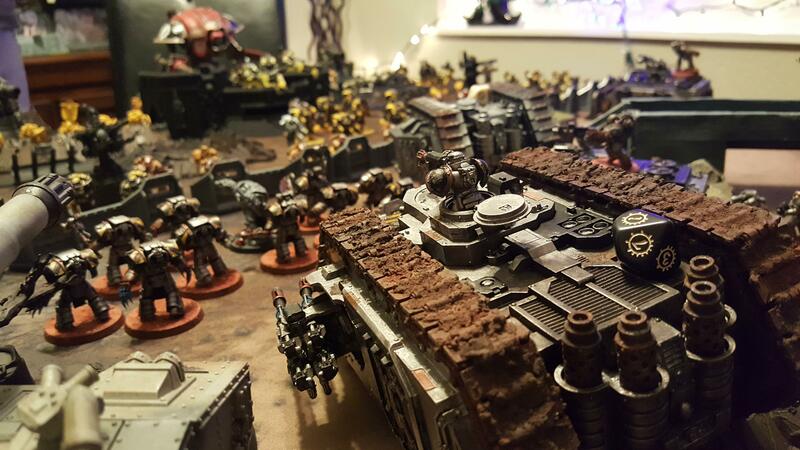 They had managed to hold the Iron Warriors at bay, giving themselves extra time to defend the city itself and a take a much needed rest. Below is the character progression results for the Iron Warriors in game 1 and 2. Some of the names are N/A on both categories because they did not partake (due to game 1 injuries or only first appearing in game 2). 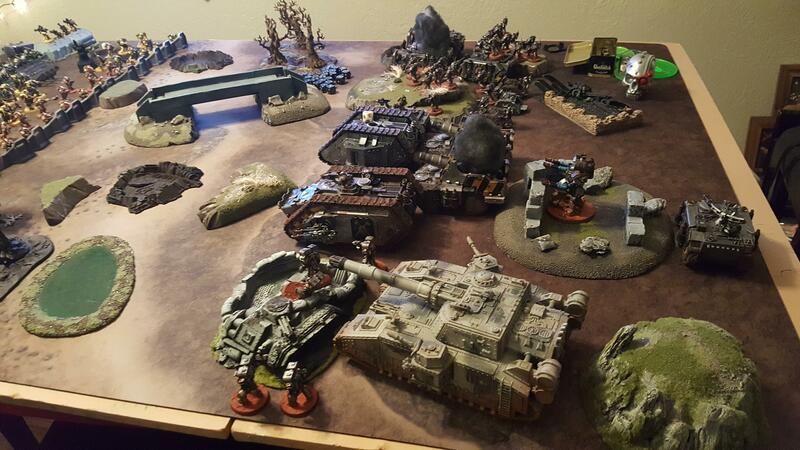 As you can see all my sgt’s are now out of action for final game, save the Iron Havocs (who got ANOTHER CC ability!?) and the 1 tactical squad sgt. I am not sure what all the Imperial Fists got except for Sigismund is now out for the final game after doing almost nothing in this one. Pollux survives and keeps on going and 1 breacher sgt has now gone up +2 toughness!! 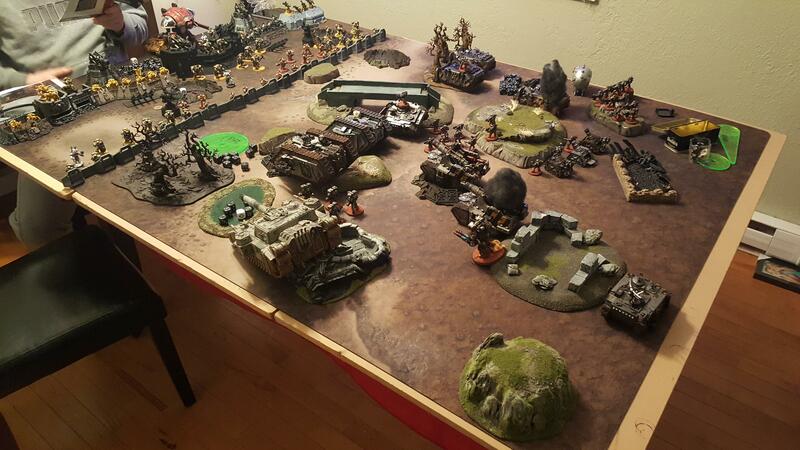 The final game in our mini campaign will take place in mid January and see both primarchs take the field of battle. Tune in next time to see who can take the campaign! That is a great idea. I’ll try and get more of those types of shots, I love those types of photos as well. Great looking, epic game against the hated yellow bastards!